Ben Simmons was a no-show in Game 1, and the Sixers can't afford a repeat of that against Brooklyn. 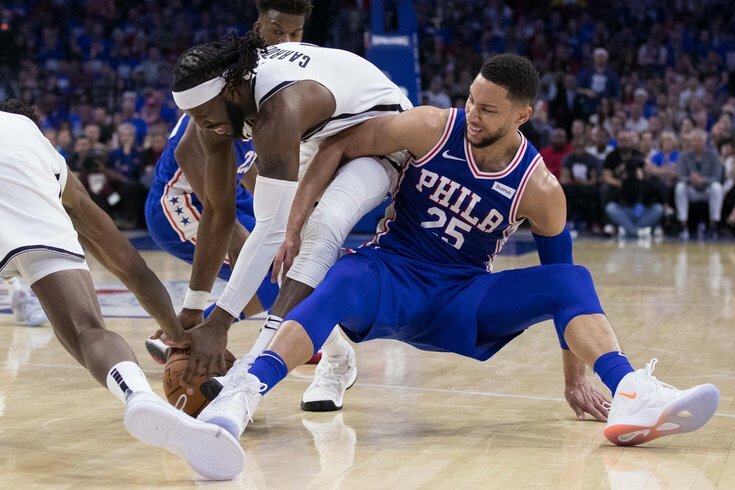 Philadelphia 76ers guard Ben Simmons (25) and Brooklyn Nets forward Ed Davis (17) battle for a loose ball during the third quarter in game one of the first round of the 2019 NBA Playoffs at Wells Fargo Center. The absence of a jumper in Ben Simmons' game has been looming over the Sixers for most of the last year, with the whole world seeing how it limited his effectiveness against the Boston Celtics last May. Down the road, that was always going to be a major question in these playoffs — the Raptors have put him in shackles all year, and Milwaukee's Giannis Antetokounmpo made him look like a child in their matchups this season. But against a team like the Brooklyn Nets? That's a team Simmons should be thriving against. They don't have the size or the bodies to shut him down. Or at least they shouldn't, because Simmons' Game 1 performance was one of the worst games he has played in his career, full stop. Simmons (nine points, seven rebounds, three assists) was a -21 against Brooklyn on Saturday, and that may overstate his contributions to the game. Two of his baskets came as the game was basically out of reach in the fourth quarter, with Embiid drawing so much attention that Simmons was able to deposit a couple of wide-open looks at the rim. Is the help at the rim what it needed to be on that play? Absolutely not. But Simmons is spoken of as an All-Defense type talent, routinely called one of the most versatile defenders in the league. We saw almost none of that against Brooklyn. When Simmons is at his best, he is proactive in every way. He's making cuts, he's leaping for steals that look impossible in transition, he's trying to dunk on someone's head in traffic. Sometimes the Sixers will get burned by this style, but it ultimately leads to good things for them on the whole; you'll take him getting burned on a couple of steal attempts if it means he produces fast breaks and open looks in transition. Saturday was Simmons at his worst. His passing gifts are significant, but no one is ever going to notice or care if teams disrespect him so much as a scorer that they don't even pretend to contest his shots. Here's a perfect example of this phenomenon. With Philly trying to make one last run late in the fourth, the Sixers got a stop thanks to some spectacular defense from Joel Embiid. With the ball in Simmons' hands and the Sixers down 11, Simmons took the opportunity and fumbled it right back to Brooklyn. Simmons is 6-foot-10 and an incredible athlete. There is absolutely nothing physically stopping him from taking that possession and dunking Jared Dudley into oblivion. Mentally is a different story. His passivity got the best of him, and the Sixers suffered as a result. "I do agree at times he passed into some tight windows. He's trying to play with that pace and speed and still be a point guard, share the ball," Brett Brown said after the game. "Ben did have a down night by his standards, obviously. He'll be back, he's too competitive and too good." Simmons is competitive, and he is good, I take no issue with that part of the feedback. But I don't think it should be taken as a certainty that he's going to change the underlying mentality that drives the way he plays, and when that is combined with his current weaknesses, it adds up to a recipe for agony in the playoffs. The fans in South Philly felt every bit of that agony on Saturday afternoon. The rained boos down on the players all throughout the game, as early as the second quarter with the Nets on an 18-1 run. But the most frequent target of their ire was Simmons, who was booed at the free-throw line in the second half, once after a miss at the free-throw line and again when he bricked the second in the pair. Rather than let it roll off of his shoulders, Simmons sniped back at fans after the game concluded. "If you're going to boo, stay on that side," Simmons said. "That's how I feel. If you are a Sixers fan and going to boo, stay on that side." Philly fans get piled on for all sorts of terrible reasons, but I can tell you this — when they boo, you almost always earned it. Tobias Harris was basically a no-show on Saturday, and he didn't get subjected to the same treatment. Jonathon Simmons was a -16 in 11 minutes, and the fans still rose to their feet and let out sighs of disappointment when he missed an open corner three in the second half. The expectation level is different for Simmons. He's the guy who has been compared to LeBron James, Magic Johnson, and other uber-talented prospects that have come through the pipeline over the years. It doesn't appear the Nets particularly care about any of that. During his own postgame availability, D'Angelo Russell was asked about whether the team's success against Philadelphia this season is a result of a good matchup for them. In his answer, he spotlighted the two guys who show up on scouting reports for opposing teams every night. "It's early to tell," Russell said, as he went on to say you can't use regular-season results to evaluate a playoff matchup. "When you got a player like Jimmy [Butler] and Joel [Embiid] over there, those caliber players, you can never count them out. So our job is to keep getting stops." Simmons likes to believe he is that caliber of player. His status as an All-Star and his night-to-night production throughout an 82-game schedule goes a long way toward solidifying that belief. But Brooklyn sent Simmons a very clear message in Game 1, just like the Celtics did last year: we don't respect you like that, and we dare you to beat us. It is up to Simmons to decide if he wants to rise to that challenge, or if he is content to let the game control him instead of the other way around. It is up to Simmons to decide if he wants to use a unified reaction from thousands of fans as a motivational tool or a punching bag to lash out on. It has always been, it will always be, up to Simmons. He has gifts that few others have to work with and an elite supporting cast alongside him. But he has to actually use those things for it to matter. On Saturday, he barely even made an attempt.